The Irreplaceable Void | To Be, To Be. Tutubi. 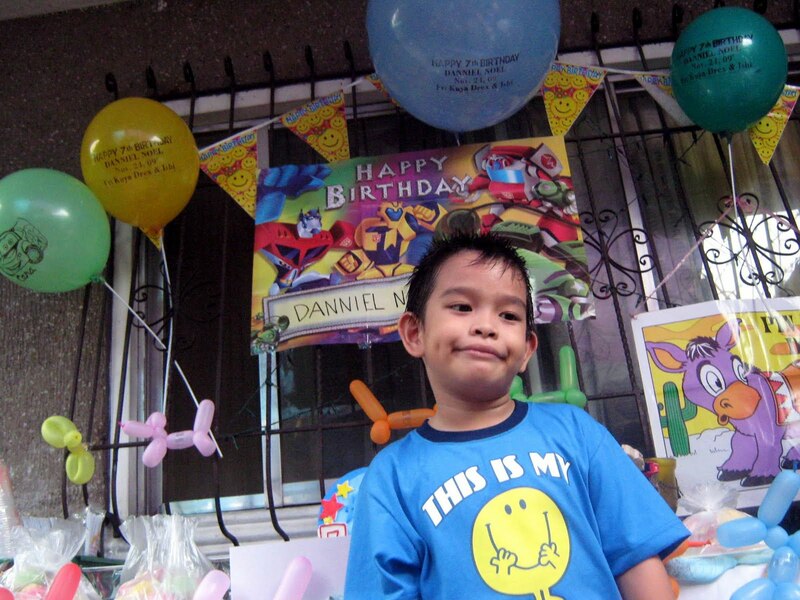 This is my son Danniel, who turned 7 yesterday. Happy birthday and I love you so much, anak! I got this story from a forwarded email and I cried while reading this. I hope you learn from this as much as I did. Especially for parents, please tell your kids everyday how much you love them. from the bathroom to cook the noodles. One is for you and the other is for me. However, I was afraid that the noodles will turn cold, so I hid it under the blanket to keep it warm till you return. But I forgot to remind you 'cos I was playing with my toys...I am sorry Dad..."
day's work, the post office called. Due to the peak season, the post master was also on an edgy mood. He called to tell me that my son has attempted to post several letters with no addressee. Although I did make a promise never to hit my son again, I couldn't help but to hit him as I feel that this child of mine is really beyond control. Once again, as before, he apologized, ' I'm sorry, Dad' and no additional reason to explain. I pushed him towards a corner, went to the post office to collect the letters with no addressee and came home, and angrily questioned my son on his prank, during this time of the year. able to post the letters. But recently, when I went back to the postbox, I could reach it and I sent it all at once..."
After hearing this, I was lost. Lost at not knowing what to do, what to say.... I told my son, " Son, mummy is in the heavenly kingdom, so in future, if you have anything to tell her, just burn the letter and it will reach mummy. My son, on hearing this, was much pacified and calm, and soon after, he was sleeping soundly. On promising that I will burn the letters on his behalf, I brought the letters outside, but couldnt help opening the letter before they turn to ash. I miss you so much! Today, there was a 'Talent Show' in school, and the school invited all mothers for the show. But you are not around, so I did not want to participate as well. I did not tell Dad about it as I was afraid that Dad would start to cry and miss you all over again. Dad went around looking for me, but in order to hide my sadness, I sat in front of the computer and started playing games at one of the shops. Dad was furious, and he couldnt help it but scolded and hit me, but I did not tell him the real reason. Mummy, everyday I see Dad missing you and whenever he think of you, he is so sad and often hide and cry in his room. I think we both miss you very very much. Too much for our own good I think. But Mummy, I am starting to forget your face. Can you please appear in my dreams so that I can see your face and remember you? I heard that if you fall asleep with the photograph of the person whom you miss, you will see the person in your dreams. But mummy, why havent you appear? Drink less, smoke less, cos nothing can replace your good health, not even business nor clients. Try thinking this way, are you able to work till your clients are totally dependent on you? or your boss is totally dependent on you? In this society, no one is indispensable. Take care of your health, so that you can take care of your little precious and your loved ones. Beauty lies in loving yourself first. With confidence and loving yourself, you will see the beauty in other things around you. You will be able to work better and happier. Don't let your health be affected by your work or your boss, so nothing matters more than your well being. Hi there! I am having a holiday contest for December and I am looking for sponsors. You can sponsor anything you want. Cash, EC credits, ad spots, gifts; its up to you. Will you be a sponsor? Thank you for your time.